Welcome to Sidney Jackson & Son Ltd — a family run business. With over 50 years as a Ford Retail Dealer, we have the experience and expertise to deliver the very best in new and used car sales, servicing, repairs and parts. Sidney Jackson & Son Ltd was established in Butley, near Macclesfield, in 1920, initially selling tractors to the local farming community and later adding a coach service and garage repairs. 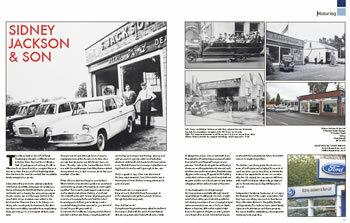 In 1955, we were appointed a Ford Retail Dealership, an appointment which we are proud to still hold. Sidney Jackson & Sons in the press. With over 50 years in the post, our current Dealer Principal, Jimmy Jackson, is the longest serving Dealer Principal in the country. He is looking to continue the family tradition by passing on the reins to his son Tim, who has worked in the business since leaving school and will become the third generation of the family to head the company. We are extremely proud of the relationship we have built up with our customers, many of whom are more like friends. As a result a large amount of our business comes from recommendation and repeat, often with several generations of families being customers. Hence our motto — Part of the family. The full range of new Ford cars is available along with a constantly changing range of used cars, and we have access to 1000s of nearly new Fords through the Ford Direct system — if you can’t see what you want in our listings, let us know and we will try to find it for you. Our service department has all the latest Ford diagnostic equipment and our mechanics are fully trained to Ford standards, which means that we are able to offer a superb after sales package, covering servicing, repairs, MOT testing, parts, accessories, batteries, tyres and exhausts.